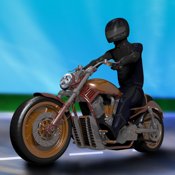 If you liked Highway Drive, then you will love Freeway Biker, the new driving game on the street. The thrill remains similar as you attempt to speed past slow moving cars and trucks. What’s more, using your skillful biking you can drive vehicles and obstructions right off the road! Collect coins and ride till you drop. With three lives on your zipping motorbike, you are free to drive on and on, that is until you crash into obstructions and lose them. But wait, there’s a twist! Dairy Baba’s farm has lost millions of its cows, who have incidentally taken to the streets. You can dodge these lost and upset creatures as well, and also drive them off the road to help Dairy Baba get his cows back. BEWARE! Do not hit or strike the lost animals, or angry Dairy Baba will take away one of your lives for one of theirs! Tilt your device left and right in order to dodge upcoming vehicles and animals while steering yourself towards coins. The speed of your bike increases every few hundred meters so be prepared to dodge with all your might!